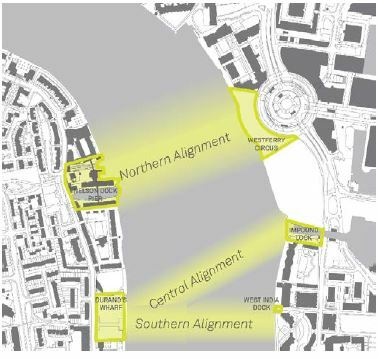 The central alignment is of course the same as the well-known ReForm/Elliott Wood (www.rotherhithebridge.london) design. This route was imposed by the PLA requirements as defined at the time, but since these requirements are now subject to further consideration, two further possibilities are being offered. We consider this to be a non-starter; it combines an inconvenient landing point on the East side with a very tight route on that side, close to existing development. Because Westferry Circus is elevated, the height alignment (ramps, steps, lift) is less demanding. The routing on the West side of the river will be somewhat challenging but would be well worth resolving considering the obvious merits of this location. You will not be surprised to learn that our current preference is for this route!